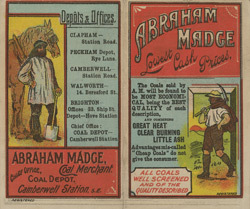 This is a beautiful and colourful leaflet for Abraham Madge, a coal merchant. Coal and coke were used for fuel for burning fires in homes during the 19th century. One way of purchasing coal was to buy it by post from a company such as Abraham Madge Coal Merchants, and it would be delivered to the local railway station. Coal was kept in cellars below the house and then carries to the upstairs rooms like the kitchen or the sitting room.